As your Wedding Celebrant, I have a tremendous passion and gift for what “I DO.” I love crafting and performing ceremonies that are a reflection of each couple and their love story. I encourage you to browse through my site to learn more about the customized ceremony options I recommend. Whether you are looking for Officiant only service, a basic or all inclusive wedding package – I’m here to help! Want to get married on the Colorado River. The Celebration River boat makes for a great venue. 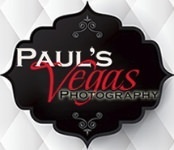 The follow is a list of Paul's Vegas Photography favorite Vendors, organizations and friends.